Nasir Al-Mulk Mosque ( also named Pink Mosque ) , it was built in Qajar Dynasty and in 1888 . 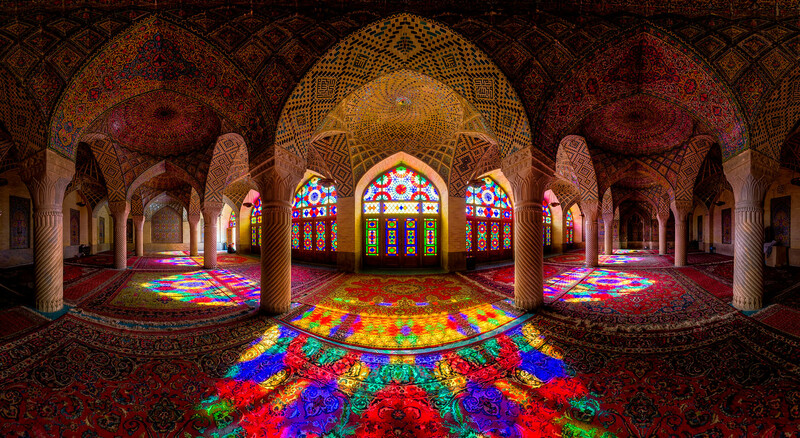 This panorama is taken Using 4 Fisheye Lens shots , you can see Beautiful Stained Glasses and Artworks in this Mosque . 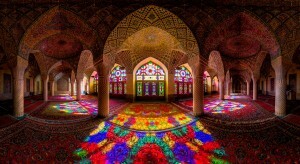 what make this Photo Special is the Symmetry of Lights that came from windows into the mosque and on the Carpet Ground . in Early morning you can see colored lights coming inside mosque , and best time fo visiting this place is in beginning of winter and about 8-9am . but if you wanna Reach such Symmetry , you have to wait , Lights direction will be to the left side of mosque first and then slowly it moves to the right side . Please visit my Architecture Gallery to see other Pics of Nasir al-Mulk .